Before the Pacific Coast League was formed in 1903, Sacramento teams played at a park owned by the Sacramento Agricultural Association on a large parcel of land bordered by 20th, 23rd, B and H Streets, and later at a diamond called Snowflake Park bordered by 28th, 30th, R and S Streets. Beginning in 1898, the games were played at the Oak Park Recreation Grounds, on 33rd Street between 5th and 6th Streets (now known as McClatchy Park). 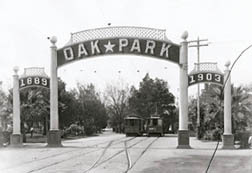 The Oak Park Recreation Grounds was a large facility which had a skating rink and concession stands in addition to the baseball diamond. That is where the first Pacific Coast League game was played between the Sacramento Senators and the Oakland Oaks in 1903. To commemorate the occasion, a parade was held from the State House Hotel at 10th and K Streets to the ball park, and the Governor threw out the first pitch. The Senators played the home games of their first season at the Oak Park facility. Although the team played well, finishing in second position, owner Mike Fisher claimed that he made more money on the road than at home. So at the close of the first season he began discussions to relocate the team. When the Sacramento Chamber of Commerce rejected Fisher's offer to sell them the team for $5,000, he decided to retain ownership but move the team to Tacoma. There was no Pacific Coast League team in Sacramento from 1904 through 1908. Instead, Sacramento fielded a team in the California State League, which was branded an outlaw league by organized baseball. In 1909, Sacramento rejoined the Pacific Coast League, when the league was expanded to add Sacramento and Vernon. The Senators opened the season at the old Oak Park diamond on March 30. Although the park owners had promised to make improvements, they still had not reshingled the grandstand roof or built a visiting team clubhouse or new entrance. Weeds grew in the field, and there was a pile of rubbish by the right field fence. Nevertheless, 5000 fans turned out for the first Sunday game. By the end of the 1909 season, Boston Red Sox owner John I. Taylor had acquired a majority interest in the team and there was talk about a new ball park. 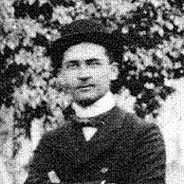 In the late 1890's, West Sacramentan Edward Kripp had been the owner and manager of the most successful baseball team on the west coast. The team, the Sacramento Gilt Edge, was named after Gilt Edge Lager, made by the Buffalo Brewing Company. It had won the California League pennant in 1898, 1899, and 1900. Kripp was a successful and colorful businessman who ran the popular Dreamland Dance Hall, on Seventh Street between I and J, in Sacramento, as well as a gambling hall in San Francisco. 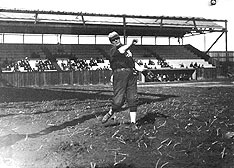 When PCL baseball returned to Sacramento in 1908, he decided to expand his interests by building another establishment where beer would be sold. It would be another gambling casino with an adjoining baseball park. For the site, he selected a former garbage dump at the southeast corner of 11th and Y Streets (now Riverside and Broadway). This was just a seven minute trolley ride from downtown Sacramento, much closer than Oak Park. It was still outside the city limits, though, so Kripp did not have to deal with the Sacramento Police Department. The new ball park, named Buffalo Park after the brewing company, was opened with an exhibition game against the Chicago White Sox on March 9, 1910. The regular season opened three weeks later. At first the field was all dirt, measuring 310 feet down the left field line 280 feet to right field, and 405 feet to center field. A tall board fence with barbed wire on top surrounded the field to keep non-paying fans from watching the action. There were seats for 5000 paying customers in a tall elegant wooden grandstand and big commodious bleachers. The player dressing rooms were behind the right field bleachers. Grass was planted in the outfield in 1911 and in the infield in 1912. In later years, other improvements resulted in lengthening left field and increasing the park's seating capacity. Buffalo Park remained home to the Senators through World War I and turbulent times that saw continuing efforts to move the team to Tacoma. It kept the name given to it by Edward Kripp until the team's new owner, Lew Moreing would have it renovated in the 1920's. Copyright © 2003. William B.Shubb.